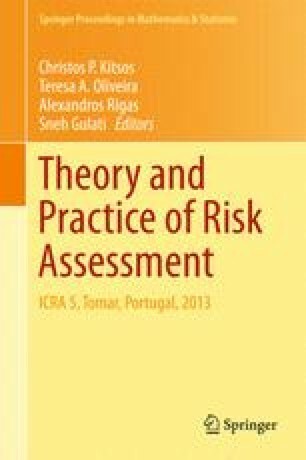 This work deals with the application of resampling techniques together with the adaptive choice of a ‘tuning’ parameter, the block size, \(b\), to be used in the bootstrap estimation of the extremal index, that is a key parameter in extreme value theory in a dependent setup. Its estimation has been considered by many authors but some challenges still remain. One of these is the choice of the number of upper order statistics to be considered in the semiparametric estimation. Block-bootstrap and Jackknife-After-Bootstrap are two computational procedures applied here for improving the behavior of the extremal index estimators through an adaptive choice of the block size for the resampling procedure. A few results of a simulation study will be presented. Research partially supported by National Funds through FCT – Fundação para a Ciência e a Tecnologia, project PEst-OE/MAT/UI0006/2014 (CEAUL) and PEst-OE/MAT/ UI0297/2014 (CMA/UNL) and UID/MAT/00297/2013 (Centro de Matemática e Aplicações).